After years of running and advising startups, I’ve found that many businesses struggle with friction between sales and marketing. Sales often complains that marketing is not generating quality leads. Marketing, on the other hand, criticizes sales for not properly following up with prospects. In the few companies I was involved with where marketing and sales were aligned, the difference was palpable. These businesses had a clear go-to-market strategy that translated into well-defined priorities for every employee. They also had a much stronger company culture and terrific morale across the organization. On paper, aligning sales and marketing shouldn’t be hard. Marketing, after all, has the same goal as sales (or, as Peter Drucker said, “the aim of marketing is to make selling superfluous”). In practice, however, finding a good fit between the two departments is one of the more difficult problems in business. This problem is all the harder in the age of inside sales. With shorter sales cycles and lower price points, there is very little opportunity for sales and marketing to collaborate on specific deals. Throw in the typical strong personalities of sales and marketing leaders, and you have an interesting challenge. 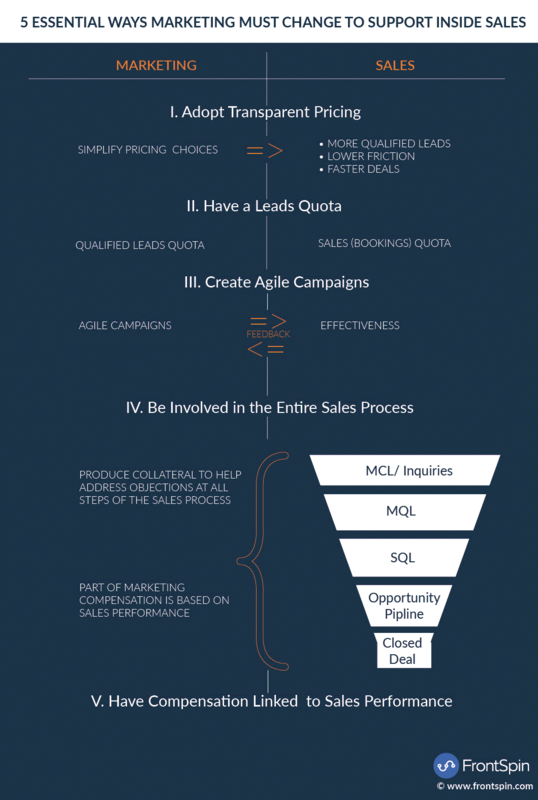 Solving the sales-marketing alignment challenge is critical to your business success. For inside sales to work well with marketing, it is imperative that marketing adopt a few key changes to its principles and processes. Selling software used to involve sitting across from a prospect, showing off a product demo, and then offering a custom quote based on the customer’s requirements and input from the sales manager. This method does not work in the present-day context. Buyers today have access to much more information, and they complete nearly 60% of the sales cycle before even talking to a rep. They demand transparent pricing in order to purchase only the products that fit within their budgets and feature requirements. More qualified leads: Transparent pricing helps buyers qualify your solution for their budgets and reach out only if there is a fit. By pre-qualifying buyers this way, you can ensure that only higher quality leads get through to your inside sales team. Lower friction, faster deals: At an average of 45 days, inside sales cycles are significantly shorter than field sales. To sustain shorter cycles, you want prospects to make purchase decisions quickly. Transparent pricing ensures that your sales team spends the least amount of time possible on pricing. They can focus on the more valuable task of sharing the benefits of your solution for a specific prospect’s needs. Ideally, you want your pricing to be as easy to understand as possible. You can vary pricing by features or users, but make sure to optimize for, at most, two variables. More than that and you will confuse prospects and lengthen the sales cycle. 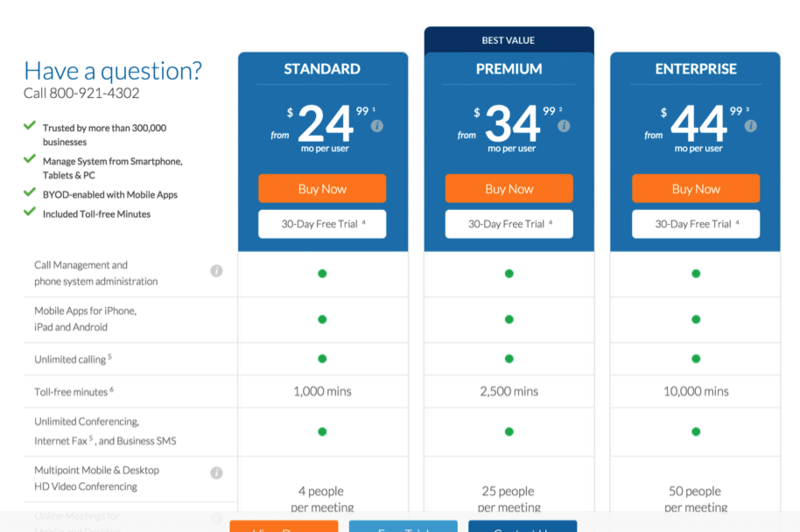 RingCentral is a great example of transparent pricing. It offers pricing based on number of users and edition (bundle) chosen. With just three different plans, prospects don’t have to struggle with choosing from endless plans and customization options. This removes friction from the sales cycle and helps RingCentral sell more. Contrast this with their competitor ShoreTel. 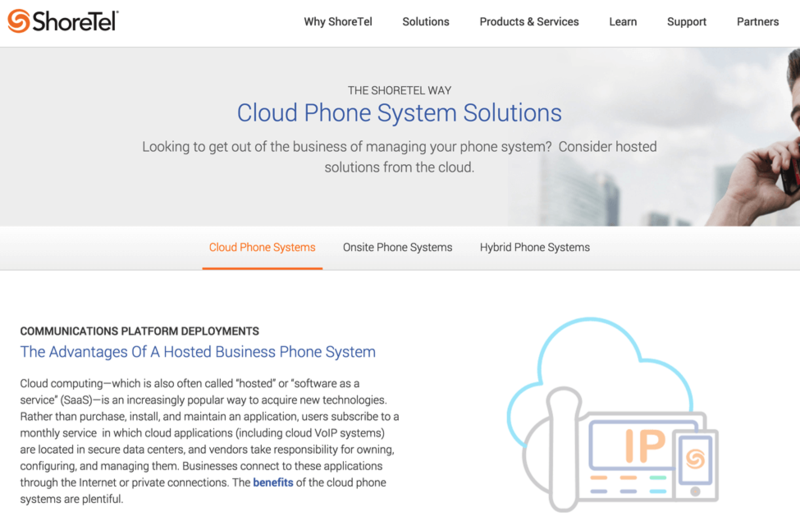 Although ShoreTel offers similar products, its pricing plans are confusing and non-transparent. Buyers who land on the ShoreTel website have no option but to contact a sales rep, even if the products are beyond their budget or requirements. More options work well with enterprise sales where your goal is to maximize revenue per deal, but in a high velocity inside sales environment, limiting choice yields better results (600% better, according to one study). By directing marketing to adopt transparent pricing, you will ease the buyer’s decision-making process, thus aiding the inside sales team. The performance of a sales team is a function of the total number of leads it receives each month. The higher this number, the more leads it can process, and the more it can sell. This is true for every sales team, but is all the more pertinent for inside sales. The inside sales cycle is much shorter than field sales (around 45 days versus 6 to 9 months for field sales), and inside sales reps are not bound by physical limitations (such as taking meetings), which enables them to handle much higher lead volumes. Thus, a high velocity inside sales team needs a constant influx of qualified leads delivered at a regular rhythm to be successful. This is the reason marketing must have a monthly leads quota. If marketing can’t send enough leads to sales even for a single month, it will be difficult for the inside sales team to meet its bookings number. This is bad for the bottom line and worse for sales-marketing alignment and morale. For this idea to be successful, however, sales and marketing must work together to define what makes a qualified lead. In the past, it was common to use BANT (Budget, Authority, Need, and Timeframe) as qualifying criteria, though today more relaxed criteria is used. Once sales and marketing agree on a definition of a qualified lead, marketing can be held responsible for a monthly qualified leads quota. Give your marketing team a leads quota with well-defined qualification metrics. This is necessary for the success of your inside sales team. Prior to inside sales, it was typical to have long lead-time marketing campaigns and not get the results of their effectiveness until months later. So, marketing heads would draw up year-long marketing plans in November, and then wait until March-April to see whether the initial campaigns worked (or not). You had little access to data, and whatever little data you did get often took months to roll in. Marketing campaigns generate more data: You can launch a brand new marketing campaign, buy some PPC traffic to test your messaging, and get tons of actionable data within hours. If the data passes your benchmarks, you can then go ahead and launch it at scale, passing the leads to your inside sales team. Inside sales teams generate results faster: Once the leads start rolling in, a competent inside sales team can close them within days. Thanks to these shorter inside sales cycles, your marketing team can get constant feedback on the campaign’s effectiveness. In this scenario, the only way to succeed is by running agile campaigns that can accommodate feedback from inside sales. Your inside sales reps should be in constant touch with marketing, telling them exactly what works and what doesn’t. Marketing, in turn, should use this data to optimize the campaigns constantly for best results. Want to get Sales and Marketing talking? Kissmetrics is a great tool to help you find out more about your customers and online sales funnel. Learn everything about how your customer and prospects interact with your online properties. Try Kissmetrics today! Make sure your marketing campaigns are flexible and adapt as per feedback from inside sales. If something doesn’t work, marketing should move quickly to change course. If something does work, marketing should increase spending on it. It is inevitable that your prospects will raise objections in the course of the sales process. How effectively your reps can answer these questions will be instrumental in determining your win rate. Traditionally, the responsibility for addressing objections falls upon sales reps. In my experience, however, you see a lot more success by offloading this duty to marketing and involving marketing in the entire sales process. This will also save your sales reps’ time since a majority of reps spend up to 30 hours a month producing sales material. As an example, in my last company, our customers in the healthcare industry would go through the entire buyer’s journey, but raise objections about HIPPA compliance (required by government regulation) before making a purchase decision. Of course, our reps would answer their queries, but it was usually haphazard and dependent on the individual rep.
To meet these challenges, I directed our marketing department to collaborate closely with inside sales and gather a list of common customer objections. Marketing then went to work creating detailed material for each query and distributing it across the team. Any time a rep encountered an objection, he or she could use this informational material to move customers further along the sales cycle. Thus, whenever our healthcare customers raised objections, they received a detailed whitepaper on HIPPA compliance. Since this document was common throughout the sales team, we could also answer customer queries in a consistent manner. The results were telling. Our win rates increased dramatically, and we quickly became the leading SaaS Contact Center Solution for the healthcare industry. Marketing can no longer just hand over leads to sales. It has to be involved in the entire sales process, producing informational material and helping sales reps address prospects’ objections in order to nudge them down the sales process. A professionally produced marketing document will work much better than a quickly drafted email from a sales rep in answering prospects’ questions. We’ve already discussed how marketing has to carry a leads quota. In addition, for true sales-marketing alignment, marketing’s variable compensation should be based on the inside sales plan achievement. Marketing gets compensated based on its role: Once marketing is involved in the entire sales process and carrying a leads quota, a part of its compensation should be linked to its role in the sales cycle. Marketing works better with sales: Sales often feels that marketing gets compensated even when sales does all the heavy lifting (i.e., making the actual sale). By linking marketing compensation to sales achievement, you will ensure that marketing is more involved than ever in helping sales achieve its goal. Once marketing is more involved in the sales process, part of its variable compensation should be linked to sales performance (around 25%). This can also help in better sales and marketing alignment. Over the last decade, inside sales has been a transformative force in sales organizations, especially in B2B sales. It has changed not only the way we sell, but also the way we market our products. The inside sales go-to-market model is here to stay and is only gaining momentum. For inside sales to be successful, it is imperative that marketing adopt a few fundamental changes. This includes bringing more transparency to pricing, linking marketing compensation to sales performance, and involving marketing in the entire sales process. These changes may be hard, but they are critical for modern business. They will help you sell more, run better sales teams, and most importantly, create the all-important sales-marketing fit necessary for business success. About the Author: Mansour Salame is the Founder and CEO of FrontSpin (an inside sales SaaS provider). He is a hi-tech entrepreneur with multiple successful exits. He enjoys building high performing teams and is passionate about inside sales.